What can I say about such a powerful,loving,caring, and God fearing couple? Dr.Ann and Orlando have the heart of God. They love beyond loving, and care beyond caring.There are no words that can express my gratitude for their tireless devotion to their congregation.Day and night they labor tirelessly for their sheep.There has never been a time since I have been in this ministry that they have been too busy to listen. Dr Ann and Orlando I am so grateful Christ directed me to your church. One particular thing (among many) continues to stick in my mind, is the year I rode the bus to church in the middle of winter without a coat.I got up to testify about the goodness of God, and Dr.Orlando,an articulate, well educated man of few words,realized my plight.Before the week was out, a coat was delivered to my door.This just shows their heart. They also cover many other ministries. Drs. Orlando & Ann Adwaters have been married over 39 years. They have three sons, a daughter-in-law and two grandchildren.They are the founders of Seed Faith Christian School of Ministry & Theological Seminary as well as Seed Faith Christian Ministry in Forest Park,Georgia. Both Dr. Orlando and Dr.Ann have been saved for over 30 years. They both received their Doctorate Degree from Spirit of Truth Bible Institute. Dr.Orlando & Dr.Ann's heart desire is to educate God's people in His Word and prepare them for His work. I know Dr. Ann to be a woman of virtue,and of moral excellence, a woman of her word.Dr.Orlando has over the years shown himself to be a man of integrity and of soundness of moral character. I love my pastors and I truly thank God for their lives.Pastors keep doing what you are commanded to do, keep preaching what God gives you to preach. 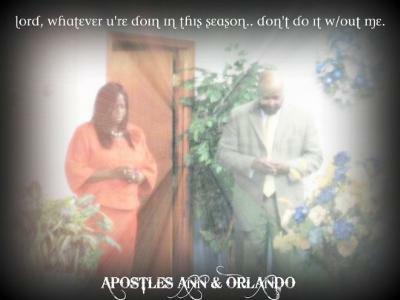 I salute my Shepherds, my man & woman of God. Thank you for watching & laboring over my soul...I love You! I am reminded of the story of the 10 lepers whom Jesus healed, but only one came back to thank Jesus. I don't know if I am the only one, but certainly I want to let you know that I appreciate you and I honor you always for the impartation that I received from you while attending Seed Faith School of Ministry. My life has never been the same. I see the Word of God in a whole new reverence. I thank you from my heart and I love you both for sharing your knowledge and time with me. Again, thank you so much! They are truly people after God's heart. Loving, sharing, but most of all living lives of truth. They are truly a blessing from God and to the world of people that have encountered them. You see Christ living through them.